This is one of those salmon dishes that changes dramatically when you use really fresh fish, since there are really only two ingredients. It’s dead simple, and you can serve it either hot, warm, or at room temperature (which makes it great for entertaining). You can also use trout or scallops (adjust the cooking time depending on their size). 1. Heat the oven to 475°F. When the oven is hot, put the butter on a rimmed baking sheet and sprinkle with salt and pepper. Put the pan in the oven for the butter to melt, about 1 minute. Watch it the whole time: As soon as the foaming stops, remove the pan. 2. Put the salmon in the seasoned butter, skin side down, and sprinkle the top with more salt and pepper. Return the pan to the oven. 3. Roast until the salmon is just cooked through, 8 to 12 minutes. To see whether the fish is done, stick a paring knife between the layers of flesh; the center should be bright pink and still a little translucent. Garnish with the parsley and serve. Skip the parsley for garnish. In Step 1, use 2 tablespoons olive oil and 2 tablespoons butter. 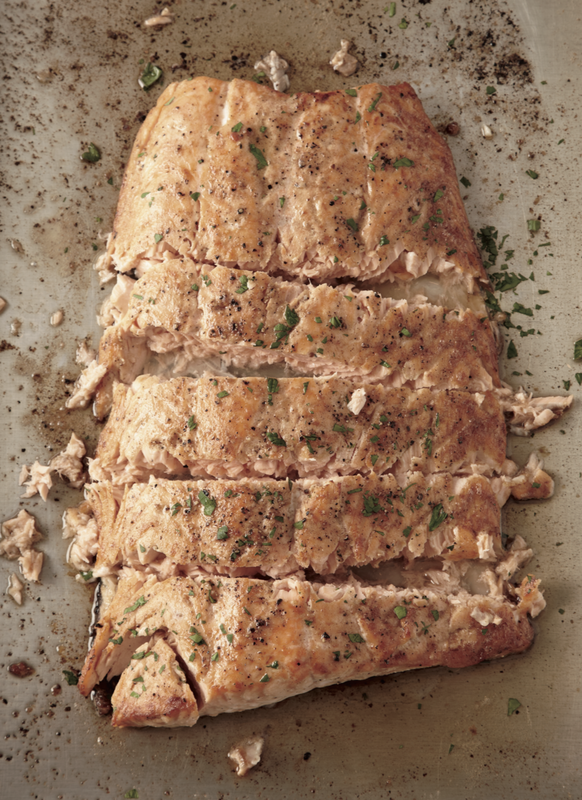 In Step 2, add 2 tablespoons minced shallot and 1 ⁄ 4 cup chopped fresh parsley or basil leaves or 2 tablespoons chopped fresh tarragon, thyme, or dill leaves to the pan along with the salmon. Continue with the recipe. Skip the parsley for garnish. Before Step 1, pit and chop 1 cup kalamata olives. In Step 1, sprinkle the salmon with pepper, but skip the salt (olives have plenty). In Step 2, add the olives and 2 tablespoons chopped fresh thyme leaves to the pan along with the salmon. Continue with the recipe.